Doomsdog Coda | From the Seasonally Occupied Territories . . . Questions were raised, by me among others, about the suitability of Lexus for the task of “rehoming” these dogs. Finding new homes for dogs who need them is the core mission of rescue groups like AMRONE, Alaskan Malamute Rescue of New England, which sponsors the Camp N Pack weekend that Trav and I have attended for the last two years. Good rescues have a network of volunteers who provide foster care, evaluate the dogs, screen and educate prospective adopters, and help raise the money to pay for it all. The Lexus Project is not a rescue, and it seemed reluctant to establish contact with Big East Akita Rescue (BEAR), which is. BEAR is based in New Jersey but covers New England as well. As its name suggests, it specializes in Akitas, which means that they screen prospective adopters with this in mind. Akitas, like Alaskan malamutes, are not for everybody — like people who live near chickens and can’t manage to keep their doors shut. Zion (left) and Sensi. Lexus Project photo. The West Tisbury selectmen, however, signed the agreement, and a week ago Friday, on March 2, Sensi and Zion were turned over to a Lexus Project representative on the ferry dock in Woods Hole. Shortly after, the photo at right was posted to the Lexus page on Facebook. It was cool to see: no photo of the dogs had appeared in either island newspaper. That’s good news. It’s also good news that, before they were turned over to Lexus, both Zion and Sensi were neutered: this was a stipulation of the agreement signed by Lexus, the previous owners, and the town. According to some reports, the previous owners had planned to breed the two dogs, or — according to one account — to “see what happened.” On the whole I think it’s best to leave dog breeding up to people who know what they’re doing. 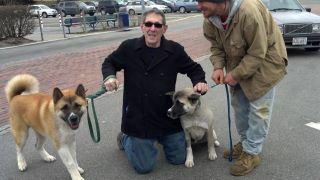 So dogspeed to you, Zion and Sensi, and may you find human partners who are worthy of you! This entry was posted in dogs, Martha's Vineyard, public life and tagged Akitas, Alaskan malamutes, AMRONE, Big East Akita Rescue, dogs, Facebook, Lexus Project, West Tisbury. Bookmark the permalink.